­CHIAVARI, Italy – Lots of Halloween treats in the windows of bakeries here in Chiavari this week. There were pumpkin shaped candies and cookies and my favorites, pan dei morti, the bread of the dead. Halloween is becoming more popular here, not the trick or treating part, the Italians haven’t quite grasped that concept yet, but the 20 somethings do like dressing up and looking weird and doing the Zombie Walks. But for those closer to and beyond 40, this weekend is a serious holiday. 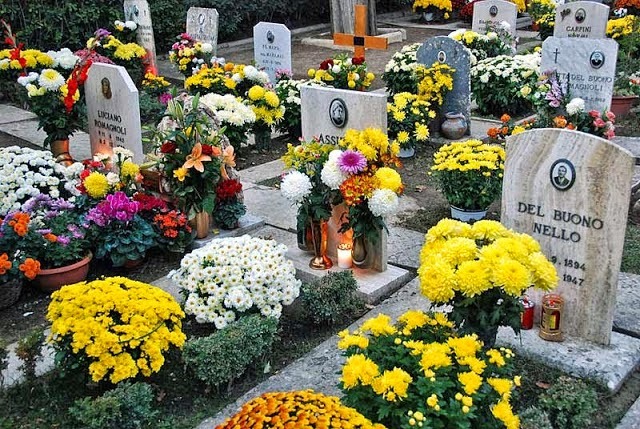 November 1st was Ognisanti, All Saints Day and November 2nd is La Commemorazione dei Defunti, All Souls Day. This is the weekend families travel kilometers and kilometers to lay flowers and votive candles on the graves of their parents and grandparents and other dead relatives. 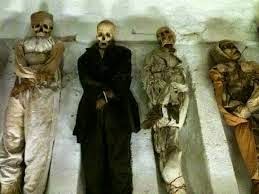 I doubt people still believe that the souls of their relatives return to Earth every year, but just in case it’s true, and because this is Italy and anything can be true, special masses are said for the dead. It is also a time for families to be together and pay tribute to those who have passed. Celebrating the dead is a very old tradition that dates back to the time of the Roman pagans. The Roman holiday was called the Parentalia, and while it may sound a bit excessive now, the Parentalia was a serious nine day celebration during which neither marriages or any type of legal business was allowed. The Romans would leave garlands of flowers and wine-soaked bread on the tombs of their dead relatives. By offering the evil spirits gifts of food and flowers, they hoped the evil spirits would be appeased and not dance around in the cemeteries raising havoc and disturbing the dead who were trying to rest in peace. After Christianity took hold the Parentalia morphed into All Saints Day. What happened is the Catholic Church found that there weren’t enough days in the year to celebrate all of the martyred saints so in the early part of the 9th century Pope Boniface IV created a collective holiday to celebrate all of them with one holiday. The date of All Saints Day was later changed to the first day of winter, as it was believed that was the time the division between earthly life and afterlife was razor thin making it easy for the dead to reenter their bodies and return to the earth for a visit. Maybe the Zombie walks represent that part of the celebration, it’s possible. Like the Roman Parentalia, All Souls Day celebrations also revolved around food but in a different way. 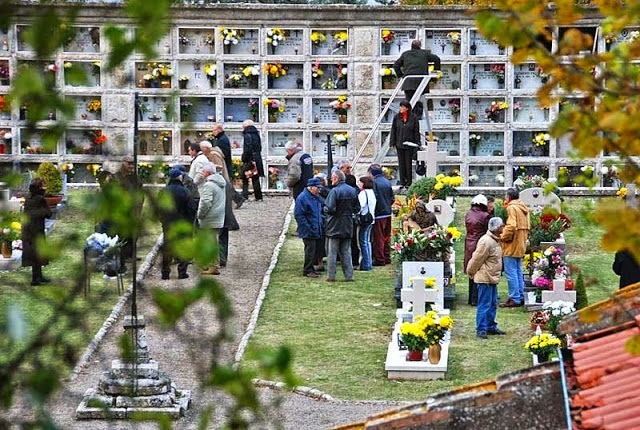 Instead of leaving food on their relatives graves, people in the province of Massa Carrara (Tuscany) distributed it to the needy. In Monte Argenario, also in Tuscany, there was a tradition of sewing large pockets on the front of the clothes of orphaned children so everyone could give them a little something, food or money, and in Abruzzo they would carve out pumpkins, put a candle inside of them and use them as lanterns. Any of this sound familiar? Like every important holiday, Ognisanto has its special treats – the most important being the oddly shaped pan dei morti. And even though pan dei morti translates to bread of the dead, it’s really a cookie made with figs and nuts and other good things. The cookies sort of look like hands in prayer, but originally they were supposed to resemble a baby wrapped in swaddling clothes. Plates of cookie babies were left on graves as a sacrifice to the evil spirits who lived in the cemeteries, as everyone knew those evil spirits were beastly ghouls who liked nothing better than feasting on tender, chewy little babies. The cookies are symbolic in other ways as well. To begin with they are made from other cookies, amaretti or savoiardi, the savoiardi being the cookies used for tiramisu, which symbolize the transformation of old into new, as one person dies another is born and life continues. The recipe also calls for dried fruit and figs, the same ingredients used in pre-Christian offerings to the dead. In the past they would darken honey by heating it on a stove to make the cookies as dark as the earth in a burial ground, but today a little ground cocoa is used instead. 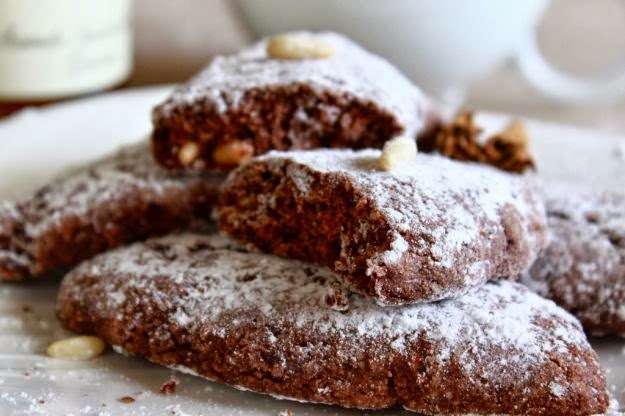 The cookies are dense and chewy with a bit of crunch from the ground amaretti and pine nuts, which give the idea of crunching dead people’s bones. Yum, yum, crunchy bones. So how does that song go – everything old is new again? It would seem that is true, at least here, right down to the bone crunching end. This Italian Life now has a Facebook Page. You can get there by clicking the Facebook badge on the right hand side of the page or going to https://www.facebook.com/thisitalianlife. I’m still working out the kinks, and the badge is kind of crummy, but it will take you to daily updates of life in Italy. Today you'll find more info on the origins or Halloween. I hope you’ll check it out, leave a comment or two, and while you are there it would be nice if you gave the page a Like. Right now there are 20 likes and one of them is mine. Thanks.